Everyone can validate an idea on the viability of it before writing a single line of code, or even before the question: “how do we find a CTO”. 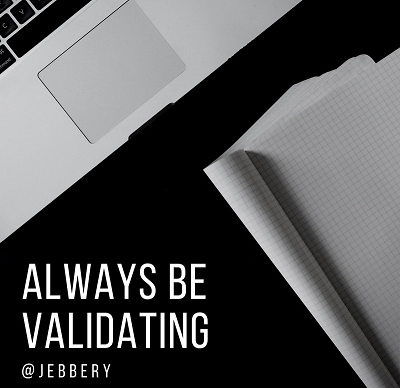 It’s pretty easy to draft up a Value Proposition to validate. There are multiple ways to validate, but one is using landing pages. I call it “validate your business idea with disposable branding”. It is setting up a landing with a brand/logo that isn’t your current branding / name. Just think of an ok name, register the TLD .site or .top (now $0.88 on NameCheap) and go to Fiverr, pay $5-$10 for a logo. Go to Strikingly, Wix, Launchrock, Squarespace or maybe even just a Google doc, point the domain to it and build a page with your value proposition and a “pay now” button. Create a Google Adwords campaign and drive traffic to the domain. Start sharing the link on social media and (with respect to communities) on forums and Facebook pages that reflects the target audience. And then see how much people make the BUY decision. So if your conversion rate is below the assumption of 5%, dispose of your branding and domain name, iterate your value proposition and try it all over again with a different branding in the same target audience group. You could reuse a “previous” branding in another target audience group that you didn’t address yet. The learings you get from this are still not “Investor Ready” but at least you have some more data to work with while building an MVP and your actual value proposition to your customer segment. The next step could be to “go out of the building!” to validate your iterated value proposition with people in real live.